In celebration of the 50th anniversary of the release of THE JIMI HENDRIX EXPERIENCE masterpiece "Electric Ladyland", Experience Hendrix, L.L.C. and Legacy Recordings, the catalog division of Sony Music Entertainment, are releasing the deluxe edition box set on November 9. Available as either a 3CD/1 Blu-ray set or a 6LP/1 Blu-ray set, both packages include the original double album, now newly remastered by Bernie Grundman from the original analog tapes. For the LP set, Grundman prepared an all-analog direct-to-disc vinyl transfer of the album, preserving the authenticity. 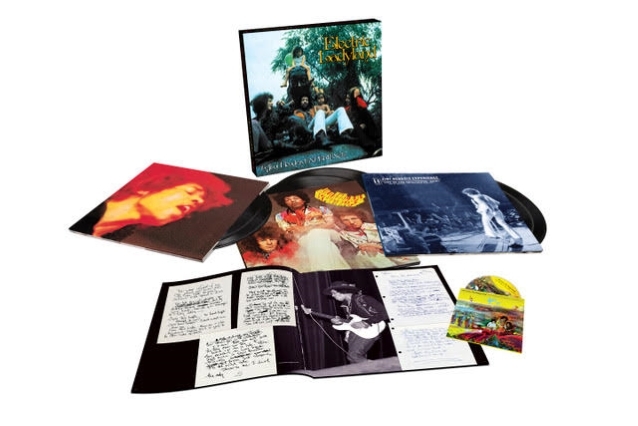 Also included is "Electric Ladyland: The Early Takes", which presents demos and studio outtakes from this period in Hendrix's career, plus a new 5.1 Surround Sound mix of the entire original album by Hendrix's original engineer Eddie Kramer. This marks the first and only time this has been done with a Hendrix studio album, and gives listeners the original stereo mixes in uncompressed 24 bit/96 kz high-resolution audio. "Jimi Hendrix Experience: Live At the Hollywood Bowl 9/14/68", part of Experience Hendrix's Dagger Records official bootleg series, is another exclusive component. The never before released recording captures the band and the mounting excitement that took place just weeks before the release of "Electric Ladyland". The Blu-ray also includes the acclaimed, feature length documentary "At Last… The Beginning: The Making Of Electric Ladyland". Lastly, "Electric Ladyland Deluxe Edition" includes a full-color, 48-page book containing Jimi's handwritten lyrics, poem and instructions to his record label, as well as never before published photos from the recording sessions that were shot by Eddie Kramer himself. "I had always dreamed of mixing 'Electric Ladyland' in 5.1 Surround Sound," says Eddie Kramer, who engineered every Hendrix album made during his life, and produced or co-produced nearly all of his posthumous material. "It always felt to me as the perfect vehicle for the kind of adventuresome stuff that Jimi and I were trying to do in 1968. The visceral thrill when we completed the first surround mix of 'Voodoo Child (Slight Return)' was palpable. It was an overwhelming experience — pun intended. We viewed this song as the surround test and the moment I heard it I flashed back on those moments when Jimi and I were mixing the stereo album, laughing at our attempts to find that 'elusive' sound." The Blu-ray for "Electric Ladyland Deluxe Edition" will contain these 5.1 Surround Sound mixes — a first for any studio album in the Hendrix canon. 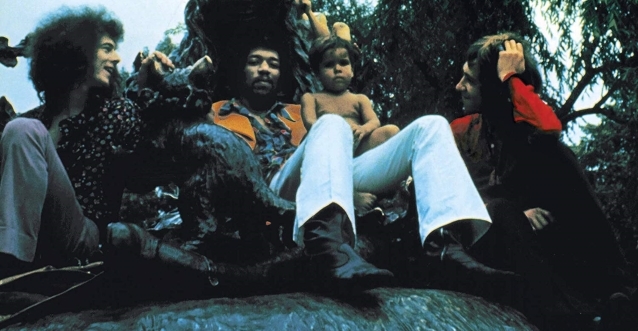 The new cover art — a Linda (McCartney) Eastman photograph of the band and children at the statue of Alice In Wonderland in New York's Central Park — was Hendrix's own choice of imagery for the album's cover image. The shot was relegated to the inside of the U.S. version on Reprise Records, printed in black and white. The U.K. version of the album released by Track Records didn't include the photo at all, and instead featured a gatefold photo of 19 naked women, which Hendrix famously abhorred. For the first time ever, the Linda Eastman photo, in full color, will grace the cover of "Electric Ladyland", true to Jimi Hendrix's original vision. 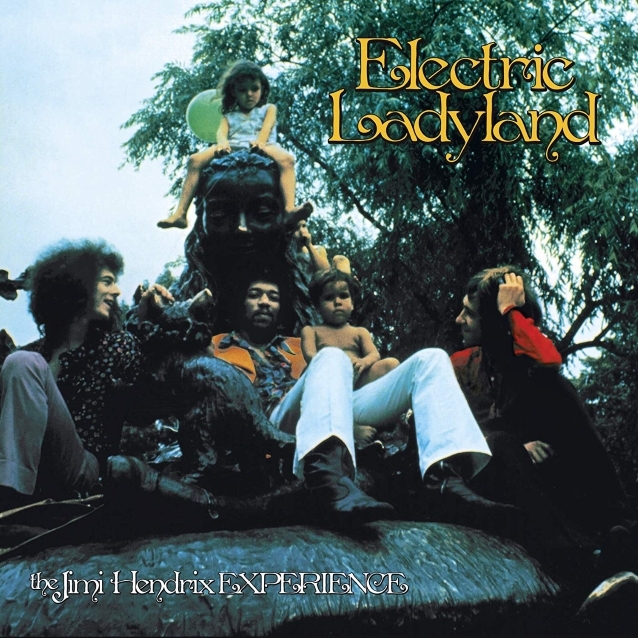 The third album by THE JIMI HENDRIX EXPERIENCE, "Electric Ladyland" was the last Hendrix studio album to have been released during the guitar icon's lifetime and reflects his meticulous involvement in every facet of its creation. In his essay, included in the full color 12" x 12" book that comes with the set, veteran Rolling Stone contributor David Fricke contends, "'Electric Ladyland' is the guitarist at a visceral, pictorial peak in his playing and his exploration of the recording studio as an instrument of composition and narrative." Originally released on October 16, 1968, "Electric Ladyland" is the source of such legendary Hendrix tracks as "All Along The Watchtower", "Voodoo Child (Slight Return)", "Crosstown Traffic" and "Burning Of The Midnight Lamp". It is commonly acknowledged by Hendrix cognoscenti as the most fully realized, cohesive project of his entire career. The only Hendrix album to have hit No. 1 on the Billboard chart, it is, indisputably, the crowning achievement of THE JIMI HENDRIX EXPERIENCE and underscored Hendrix's abilities as singer, songwriter, guitarist, and producer. It remains his most popular album outside the U.S., outpacing the guitarist's groundbreaking debut LP, "Are You Experienced". Notable for being the first album produced and directed by Jimi Hendrix, "Electric Ladyland" was largely recorded after Hendrix split from Chas Chandler — the former member of THE ANIMALS who found Hendrix in New York and brought him to the U.K., co-managing his career and producing the first two EXPERIENCE albums. There is also the introduction of outside players, namely Steve Winwood, Chris Wood and Dave Mason of TRAFFIC, Jack Casady of JEFFERSON AIRPLANE (bass on "Voodoo Chile"), and Hendrix's own future BAND OF GYPSYS bandmate Buddy Miles (drums on "Rainy Day, Dream Away" and "Still Raining, Still Dreaming"). As a result of the growing tension between Hendrix and EXPERIENCE bassist Noel Redding (who parted ways the following year), Hendrix took it upon himself to play bass on most of the songs, including the cover of Bob Dylan's "All Along The Watchtower", the only JIMI HENDRIX EXPERIENCE single to reach Billboard's top 20. Widely considered one of the greatest interpretations ever recorded, Dylan professed in 1995 that Hendrix "found things that other people wouldn't think of finding in there. He probably improved upon it by the spaces he was using." By 1974, Dylan demonstrated the ultimate show of respect when he began using Hendrix's template to perform his own song. "Electric Ladyland: The Early Takes" consists of demos for song ideas Hendrix recorded himself on a Teac reel-to-reel tape machine in early 1968, as well as early sessions at Sound Center and the Record Plant in New York. Previously unreleased versions of "Angel Caterina" and "Little Miss Strange" feature guest appearances from Buddy Miles and Stephen Stills. "Long Hot Summer" features Hendrix and Mitch Mitchell with Al Kooper on piano, and "At Last . . . The Beginning" is an early version of what would become "…And The Gods Made Love". Jimi's demos, recorded in March 1968 while he resided at the Drake Hotel in Manhattan included formative renditions of such classic songs as "Voodoo Chile" and "Gypsy Eyes", as well as fascinating sketches of songs such as "Angel" and "My Friend" which, despite their quality, did not make the album. "Electric Ladyland Deluxe Edition" includes the previously unreleased live album "Jimi Hendrix Experience: Live At the Hollywood Bowl 9/14/68", part of Experience Hendrix's official "bootleg" series. This live album documents their triumphant Los Angeles concert held a few weeks before "Electric Ladyland" was released. The recently discovered two-track soundboard recording captures the energy that had the audience in such a frenzy that many concert goers jumped into the reflecting pool that separated the bandstand from the seats. "Live At the Hollywood Bowl 9/14/68" includes selections from all three EXPERIENCE albums, as well as a cover of CREAM's smash hit "Sunshine Of Your Love". The accompanying book is filled with unpublished photos that follow the band at the Bowl, from afternoon rehearsal, to backstage to the performance itself. "At Last… The Beginning: The Making Of Electric Ladyland" documents the creation of the legendary double album. Some of Jimi's closest associates are seen on screen discussing their first-hand recollections of Hendrix and the project including JHE bassist Noel Redding, drummer Mitch Mitchell, manager Chas Chandler; Buddy Miles, Jack Casady, Steve Winwood, Dave Mason and others who participated in the "Electric Ladyland" sessions. One of the highlights of the program includes demonstrations by Eddie Kramer, who discusses the techniques Hendrix, Mitchell and Redding employed in recording the album, playing some of the original multitrack tapes to illustrate the process. "At Last… The Beginning: The Making Of Electric Ladyland" is the definitive telling of the story. The accompanying 48-page full-color book contains essays by music critic David Fricke and producer John McDermott. It is filled with detailed recording information and unpublished photos, including many taken by Eddie Kramer during the recording of the album. Fans get a rare look at Hendrix's handwritten lyrics and instructions to his label Warner Bros. for the album, drawn from his personal notebook, as well as original Warner Bros. internal memos and alternate artwork for the album.